Get an outstanding listening experience with crisp and clear sound from the Coby CV215 headphones. The 40mm neodymium driver of these Coby stereo headphones provide you with great audio performance and rich bass. With isolation stereo headphones, the Coby CV215 delivers clear sound by eliminating background noise. You get full comfort while listening to your favorite music with the adjustable padded headband of these Coby folding headphones. 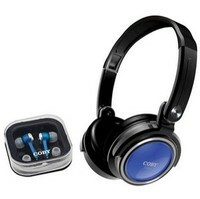 With a compactable folding design, these Coby stereo headphones make it handy for traveling or storage. You get digital stereo earphones with these Coby folding headphones that provide you with digital surround sound.